I had finished reporting in Bucharest, and in the familiar anxious dance—like a prissy dog looking for the perfect spot to piss—was looking for a place to hole up and crank out a draft. “Why don’t you just write it here?” the people at the journalist collective in Bucharest where I was staying on a mattress by a big window in the attic said. 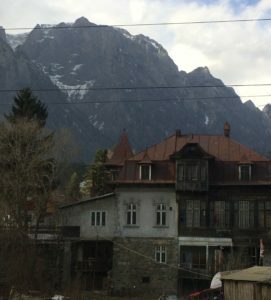 The three-story house was cozy and familiar, like a big wooden pirate ship swaying in the waves, and each night in my weeks there I fell asleep comforted by the sounds of people living their lives below—smoking and drinking downstairs, the smell of food wafting up, sirens fading in and out of the open window. It was tempting to stay. I have long dreamt of being a mouse in the collective house, surrounded by but seperate from nearby human beings living their lives in common. I wanted to see Transylvania. “Transylvania?” the Romanian journalists rolled their eyes. “Whatever you want to do, man.” I had never had any interest in going to Transylvania before, but a visit to the museum of medieval maps—most of them depicting the vast swaths of forest villages that made up Transylvania—piqued my curiosity. In his book In Europe’s Shadow, Robert Kaplan described spending a night in a 12th century clocktower, in a village called Sighisoara—it wasn’t as touristy as Brasov or as bleak as Sighetu Marmetei. In the collective’s smoke-filled kitchen, Valentina advised against it. “It’s a weird medieval tourist town.” I asked her where I should go instead. “Sibiu,” she said. But Sibiu sounded to me like the constellation of a bear, and in Google images it looked surrounded by snow-capped mountains of madness, while Sighisoara looked peaceful and quaint, and I loved the way the name sounded in Romanian, soara, Schwaaaaraaaa, rolling off the tongue, lacivious, like an old rug. In Sibiu, I imagined checking into a pension on the industrial edge of town with a grumpy old man—I imagined him monitoring my comings and goings and yelling at me about how to properly drain the water from the tiny plastic shower. I would end up in some cool little bar with strange but friendly young people. I wanted to hole up against the world, shield myself from the world, not meet anyone. Sighisoara it was. It was cheap, hidden, and exotic-sounding, like Fes, Cipango—I wanted to go to those places too. When travelling blind, you make spur-of-the-moment decisions like this, based on ridiculous illusions and intuitive caricatures. I left Bucharest’s Gare du Nord on an old, half-empty train at noon. The seats were blood-red and stained, and the only other passengers were elderly people in a kind of fugue, as if in suspension fluid. The gray early spring flew by out the window—shacks, cloddy flat fields, and one-eyed factories. We pulled through Brasov, a depressing-looking too-large town, and then left the mainline into alpine wilderness, where the escarpment of the mighty snow-covered Carpathians rose like the Paramount Pictures logo, behind the wooden Transylvania-style houses. At each village station we passed a handsome train signalman standing stoically in white gloves with his colored-paddle, like in the movie Closely Watched Trains. Transylvania really looked like Transylvania. Like a Hollywood sound stage of Transylvania, the Carpathians as awe-inspiring as the Rockies. Your first minutes on the street of an unfamiliar city are always special; what happens in later months or years can never supplant them. These minutes are filled with the visual equivalent of nuclear energy, a kind of nuclear power of attention. With penetrating insight and an all-pervading excitement, you absorb a huge universe—houses, trees, faces of passerby, signs, squares, smells, dust, cats and dogs, the color of the sky. During these minutes, like an omnipotent God, you bring a new world into being. The journey had been long, and I felt tingly and expectant. I was relieved that it seemed to be a town of substance, with real neighborhoods and a river, not just a one-horse village. To get from the platform to the train station, I walked through a dark underpass that reeked of stale piss. This was the first thing I found strange about Sighisoara—in a provincial village, surrounded by eldritch woods and mountains, why did the tunnel reek of piss? The tunnel came out in front of the stolid neoclassical little train station, like Jefferson’s Monticello. I set off walking, magnetized towards the mountain at the center of town, through empty neighborhoods where teenage boys stood on street corners, an old man bar, a sad little in-between graveyard, eventually arriving at a plaza and church by a reedy brown river. Parents pushed strollers and morosely watched their children stomp around. A footbridge went across the river and at the sheer base of the mountain, I found the little crumbling staircase up to the fortressed old city, passing by several empty tourist restaurants. Painted plastic waiter figurines were posted outside all the restaraunts like sentries. It is rare that one gets to experience UNESCO heritage completely alone, with no signs and audio tours and museums and guides and touts. The bells of the clocktower, an incredible gothic structure with painted figurines, rang out across the smoky valley. I wandered the perimeter of the fortress, inspecting the old walls and wooden guard towers at its corners. I felt lucky and happy to see it, if a bit ill at ease. It was too quiet. Certain places all of a sudden become frightening—while technically you could adapt and stay put, you ache to leave immediately, to be someplace more soothing, if not some place more soothing, then on a train, that beloved in-between neutral place.Having seen the entirety of the old fortress in an hour and not seeing a soul I had to admit to myself that there was no way in hell I would stay for one night, let alone several days. I hate rural emptiness—empty restaraunts, empty plazas, the freezerburned bovine Midwest of the sol opening up a void of dread inside. The stone walls of the buildings would be unable to keep out the emptiness outside and the emptiness would slip in and overtake me. I realized that Valentina was right, and reproached myself for not knowing myself better, for leaving Bucharest, where life had been warm and interesting and had a point. I descended the steps back to the new town, thinking that it might be better down there, hoping to find some more energy, more life. The new town below was completely different—cars, pedestrians, restaurants. Life, culture! There were glitzy pizzerias and patio bars with outdoor couches and firepits, provincial nouveau-riche spots, where bald men in track suits tried to impress their girlfriends. Through the windows of a business hotel, middle-aged men ate steaks and grew red-faced. But the whole place eaten through with a why-would-you-come-here-I’m-trying-to-escape-this-place attitude. Without my input, my feet started carrying me back towards the train station. I didn’t know where I would go or why. The little white train station, which had seemed neutral at dusk, took on a more sinister look in the dark. The dimly lit marble lobby was empty except for two stone benches by the door, the kind of benches they have in graveyards. On each bench was an old person—a man and woman—in the fugue who stared into the nothingness and silence. The monitor displaying the train times was broken and flickering. The eyes of the old woman and old man followed my every move. I went over to the ticket window and tapped on the glass. A woman in her thirties or forties was sitting back on a couch in an office doing her nails. There was a train to Bucharest at two AM she told me, and a train to Budapest in a couple of hours. I thanked her and walked away to think about it. Overwhelmed by the empty strangeness of the room, I walked over to the train station bar, where I thought I might find some clarity. The bar was a kind of still life, an Edward Hopper painting. There was no music. The woman behind the counter stopped polishing her glass and glared. A beaten down traveler sitting with a bottle of beer and a shot jerked his head up. There were three video poker machines all turned off. At a table littered with empty bottles and half-smoked packs of cigarettes were a rail-thin young Roma girl and two menacing-looking older provincial Romanian men, who all looked fucked up and had the eternal air of petty criminality about them, the bad guys in the Goonies—they were not travelling anywhere, just hanging out. They stepped out onto the patio to smoke. I went outside to smoke as well. The girl started talking to me in Romanian. “I don’t speak Romanian,” I told her. “Ah,” she wobbled, “English…Where you from? Cigarette?” she smiled, putting her hand to her lips. I gave her one and she turned back to her guys, who eyed me suspiciously, and the three of them went back to their table. Back inside, I sat down and nursed a bottle of beer, trying to decide what to do. I wanted to go back to Bucharest but the shame of having come all the way out to Sighisoara and going back in the same day seemed like too much—no one would say anything, but it still struck me as wrong. The beaten-down traveller and the bartender kept looking between the table of three and me with disturbed looks on their faces. They looked scared of them. I went out for another cigarette. The night was dark and the train station was set back from the road. Everything seemed moldy. A middle-aged man and an older man came up a staircase from town to the train station. The young man was berating the older man. Then they both disappeared. I looked inside the fluorescent grim little train station bar from outside. The three sketchy individuals were whispering to each other around the table, it looked like a painting. From the trees came an insane racket of night birds, birds with a horrible cackle unlike anything I have ever heard before. It was like a foghorn ringing out, saying leave this place, leave this place. Sighisoara had been normal in daylight—what happened? Now it felt like a strange noir, the provincial fear of an eerie little place where children sit around decapitating butterflies. I did not know where to go or what to do but I felt a strong urge to flee—new town was too far of a walk, I had a terrible feeling at the bar, so I went back inside the main train station, taking a seat on one of the benches beside the elderly woman, who hadn’t moved. The light was very dim and it was quiet. The old man stared at me and I stared back and he turned away and when he turned away I stared at the huge purple scar running from his temple to his jaw. The older woman seemed kind—she chattered to me in Romanian and I shrugged my shoulders. She made more space on the bench, but I waved her away, no, no, I don’t need more space, thank you so much. I lay my head against the wall and she moved further, making space for me to lay down, then came over to me and tried to say something I couldn’t understand. The old man watched. She got up and walked around then came back and tried to show me something, then seemed to ask me to watch her bag that she had hidden behind the bench, and I nodded yeah, I’ll watch your bag. A middle-aged man with dark hair and black circles under his eyes came into the station with his suitcase and sat beside the old man. All of us stared at the old woman who was pacing the floor and muttering to herself, then she came back to sit beside me—she pushed her bag into my face then pulled it away. I shrugged and made my best, “I’m a stupid American,” face, but she seemed to want to explain something very urgently. The middle aged man made eye contact with me from the bench on the other side and indicated, with the universal hand symbol, that she was “crazy” or not well. This made everything make more sense. The middle age man and elderly man began gesticulating and waving to me that I could come join them on their bench, but I waved them away, staying with the elderly woman but looking away as she talked to me. After a while, I got sick of this and paced the hallway, then went into the bar where the criminals glared, then went back outside where the evil birds mocked me, round and round in this circular round until I felt I couldn’t wait until two AM and had to leave as soon as possible and that Sighisoara was against me. I bought a ticket to Budapest at window. When the headlights of the train came out of that misty Eastern European darkness, I jumped aboard and settled in, grateful for a neutral place to exist for a while even if it was under bright fluorescent lights, and fell asleep. But all night, every hour or two, ticket controllers came by and jabbed a finger into my shoulder to check and recheck my ticket, even after it had already been scanned. They seemed to take a perverse pleasure in shaking the passengers awake, the way sadistic security guards do with homeless people sleeping in public places where you’re not supposed to sleep. People by and large do not want the best for one another. The lights in the train wagon were very bright and it was hard to see out the window, but I drifted in and out of sleep, the landscape outside a kind of empty Martian landscape of a few dim bedraggled lights of factories or houses in the distance. It was misty and sad, the central European blood lands, the in-between zone of empires. The train arrived in Budapest at 10 AM. The temperature but also the ambiance was much colder than warm, Latinate Bucharest. The coffee was four times the price of coffee in Romania. I hadn’t been to Hungary for years. I had fond memories of spending a night in a grand old worn-down hotel at the center of town, with a wonderful wood-panelled newspaper room in its lobby. I decided to go there. It was familiar. I arrived to the lobby under a slate grey sky and got a room. My room was not so different from the room all those years before, but as I got in and lay down my bag, I looked out the window, which looked on a concrete cornice of a nearby building that blended with the sky, and felt sad and ridiculous. The bathroom faucet sputtered brown water. A couple of gnats circled by the headboard of my little single bed-tomb. I lay down on the bed and watched the circling gnats. I pulled out my tape recorder and notepads and started the familiar work of composing a draft. On Saturday December 8th, as the Minion-like yellow vests began to congregate around the Arc de Triomphe for the fourth Saturday of nationwide riots, masked French authorities surrounded and pulled over a car in Northeast Paris. The two men in the car had just bought croissants and were headed to the demonstration. One was the well-known French ultra-leftist Julian Coupat. In the trunk—the agents obsessed with tailing Coupat likely already knew—were two yellow vests, ventilation masks, saline, and some paint. The authorities have long considered Coupat to be the “leader” of a mysterious publishing collective called the Invisible Committee, which defected from Paris and took over Tarnac, a small village in central France, over ten years ago. He came to national prominence during a legal spectacle known as the Tarnac Affair, in which members of the milieu were labeled “terrorists” for allegedly sabotaging nearby high-speed rail lines. The evidence wielded against them was the anonymously authored 2007 text The Coming Insurrection (La Fabrique/Semiotext), a sleeper hit among New School-grad-student-types heralded by the who’s who of academic Marxist celebrities. Coupat was exonerated this March when the state’s ramshackle prosecution finally came apart, ending a ten-year legal ordeal. What is really occurring, under the surface, is that everything is pluralizing, everything is localizing, everything is revealing itself to be situated, everything is fleeing. It’s not only that the people are lacking, that they are playing the role of absent subscribers, that they don’t give any news, that they are lying to the pollsters, it’s that they have already packed up and left, in many unsuspected directions. They’re not simply abstentionist, hanging back, not to be found: they are in flight, even if their flight is inner or immobile. They are already elsewhere. 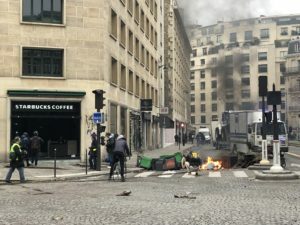 The Parisian left have been caught off guard, scrambling to position themselves in relation to a movement they don’t feel entirely comfortable with, the Invisible Committee-affiliated organ Lundimatin (“Monday Morning”) has been steadily promoting and analyzing gilets jaunes—getting in while the getting is good. That Saturday, they missed one for the history books. Paris is a city of riots, where a procession of new movements roll through like storms, but nothing like the recent unrest has been seen since 1968. The most jaded Parisian speaks about it with awe. I woke up that day to a boarded-up, empty, and unreal city, one that looked as if a hurricane was about to pass through. What followed was a classic riot. Classic in that, as some commentators have noted, it was about scarcity and rage—not labor organization. Even with the exaggerated police presence with armored vehicles and numerous checkpoints, it felt wild and unpredictable. While some of those who gathered around Gare Saint-Lazare and Arc de Triomphe were the usual suspects in yellow vests—antifa, black-block, queer activists—the majority of participants fit a different profile, rougher provincial people, gawking their way around militarized Paris. There were middle-aged women who didn’t flinch at the tear gas, trash can fires, or flash grenades. 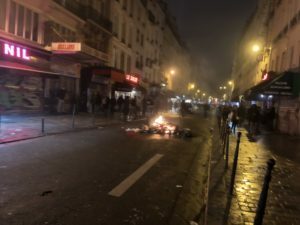 For hours, the police pushed the militants eastward out of the city, from Saint-Lazare down Grands Boulevards, in an squid-like motion—barricades, fires, and rocks, then huge crowds of people running from water cannons, gas, and flash grenades. I saw innocent bystanders caught up in the melee in Bonne Nouvelle, old men on crutches trying to get home, a mother cleaning the tear gas from her children’s eyes. There was no central meeting point or route but many police checkpoints. Everything was diffuse and confusing. I followed a big crowd of people into a narrow passageway trying to get around a police barricade, before they stampeded back out when they saw the cops were there, too. The crowd was pushed to Châtelet-Les Halles, where it melted away into casual groups. These groups walked past the Louvre into posh, shuttered Place Vendôme, just behind the Élysée Palace, where they reformed and started rioting again. It was later revealed that Macron had a helicopter waiting for him at the palace in case things got out of hand. In Place Vendôme, the yellow vests were in full control of a six-by-six block section of the neighborhood. The police were kept at bay at little fronts with bonfires, barricades, and smashed up stores. Walking around the historic neighborhood were yellow vests everywhere, filling each street. Jugs of whisky were passed around. At the lone open store, a guy offered me a bottle of water, free of charge. “Just take it!” I saw luxury cars punched, cobblestones and grates ripped up. The exclusive penthouse apartments above were all bolted and shuttered, no one looked out from the windows or the balconies—were there people inside, huddled in fear of the mob? As with most protests, I assumed there were just one or two decent-sized groups of rioting yellow vests in the streets, buffered by a much larger mass of peaceful protesters. But as I walked east, the Minions multiplied, militant yellow vests everywhere, in control of large swaths of central Paris—at Place Saint-Augustin, around Gare Saint-Lazare, bombardiers rushing to put out massive bonfires, people looking at the spectacle through the windows of packed bars. I got on the subway—Opéra and Havre-Caumartin stations closed—an announcement over the intercom that there’s tear gas in the station at Réaumur –Sébastopol. Coming up under the impressive arch at Strasbourg — Saint-Denis, there are two huge bonfires. 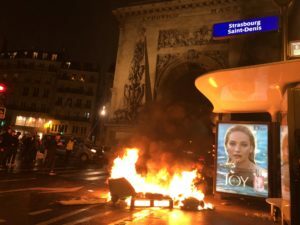 Yellow vests on every street roaming around, trash fires in the streets, several upscale boutique stores smashed. At the opposite end of the city, in the Upper East Side-like 17th arrondissement, I saw a gaggle of shell-shocked looking videographers from TV5Monde, standing outside the broken windows of their offices. A hurricane still seems the best comparison. And Paris is not the worst. Reports have shown intense street fighting in second-tier cities like Toulouse and Bordeaux. Those leaders who have sought to “reform” the deeply ingrained structures of provincial life have done so at their own peril. Macron has pressed hard on the rural mayors. The association of rural mayors has responded by opening up 33,000 town halls to the gilets jaunes. The next afternoon, I visited an old activist friend in the 20th arrondissement. He was at the riot as well. He’d also just returned from Moscow, where he participated in a public debate with Russian National-Bolshevik philosopher and organizer Alexander Dugin, who has long cultivated ties with the international far-right and is often accused of being Putin’s “destabilizing” agent in Europe. Dugin has been prescient about the seismic ideological and geopolitical shifts underway. “Dugin did say the way we’re going to deal with France is a red-brown alliance, Mélenchon and Le Pen. I thought it was kind of crazy a month ago, but now maybe it’s going to happen,” my friend told me. “He’s the smartest right-wing guy I’ve ever met. The left has no answer to Dugin. The only person who has an answer to him is Abdullah Öcalan,” he says, handing me a copy of imprisoned Kurdish leader’s pamphlet Democratic Confederalism. Everyone speaks with pseudo-mystical reverence about Le blocus—the blockade. The blockade is not rocket science. It simply means small groups of people congregating at logistical chokepoints to ground the economic system to a halt. On the southern periphery of Paris, I attended a late-night blockade of Rungis market. The area felt like a special economic zone. Rungis is the second-largest wholesale food market in the world, of vital strategic importance to Europe. It keeps Paris daily supplied with fresh food. A group of eighty yellow vests showed up and fanned out across the toll plaza—there’s weren’t enough of them to fully halt traffic, so they settled for slowing it to a trickle. A detectable ambiance took hold—the truckers honked and seemed supportive, French rap blared from a boom box, and a soccer ball was kicked around. I talked to a yellow vest named Vincent, who chatted amiably with the supportive truckers. I asked him what he talked to them about. “We ask them if they’re with us or against us. We explain what we’re about. About 80 percent are with us.” His name is Vincent, he works as an airplane inspector at Paris Orly. He used to vote socialist, but three years ago turned to the extreme right. The reason? Immigration. Now his favorite magazine is Daily Stormer. He said if Macron went down, he wanted him replaced by “the most extreme person possible.” Perhaps Hervé Ryssen, author of books like The Jewish Mafia. I asked if there were many nationalist organizations in gilets jaunes. “There are, but we don’t talk about it. When we come, we leave our other identifications at home and give ourselves over to the gilets jaunes movement.” I asked how it had gone, working with the far left. “Today, we’re all together—nothing much sets us apart. We find ourselves with the same objective, to get rid of Macron,” he said, giving an exaggerated impression of someone being hanged. The communist seemed caught off guard, but they hugged, awkwardly. “We’re citizens, all the same,” Vincent said. Matthieu lived nearby and worked as communist party functionary. The area around Rungis is one of the last communist strongholds in France. I asked him about the French media, who have been heavily targeted during the protests. “To the jews!” Vincent interjected. “No, no . . . to the big capitalist trusts.” Matthieu corrected him. I asked Vincent what would happen if Macron were no longer in the picture. The far-left and far-right would eventually have to reckon with each other. “We’re friends. For now. But not later,” he laughed. Many protesters I met in Paris bristled at the question about whether gilets jaunes is left or right—they prefer not to speak in those terms. So extremely French that they preferred for it to be framed as “alienated” and “apathetic” vs. “activated.” They rushed to add that banlieue immigrants and high school students are getting involved as well, as if the presence of brown people papers over the underlying issues. The French far left are not naïve about the risks of the ideological brinksmanship they’re engaged in with the far right. In a lengthy analysis, Lundimatin forthrightly admits neo-fascism as a possibility. “We are at a crossroads in France, in Europe, and beyond. In critical times, history is always uncertain and molten; the purists and the hygienists of the mind and of politics are at a loss. If they are not yet illiberal, the ‘yellow vests’ are already anti-liberal. But who can say whether they wish for new liberties?” The international populist right has shown itself to be adept at pursuing a hybrid strategy of mobilizing in the name of “the people” while concealing their long-term goals. In late December, the gilets jaunes mobilizations became smaller and more diffuse. Macron’s administration hoped that the movement would run out of steam at Christmas and disappear in the New Year, but as the Invisible Committee predicted: everything is localizing, everything is revealing itself to be situated, everything is fleeing. Yellow vests have learned to melt away one week, only to reappear in force the next. To dupe the police, those in Paris have taken to announcing protests in one part of town only to gather in another; blockades have appeared on major highways all over the country, and on the Franco-Spanish border. Militant, confrontational mobilizations of thousands of people have cropped up in unlikely second and third-tier cities like Caen and Montpelier, while continuing in movement strongholds like Boudreaux and Toulouse and Rouen. In Rouen, militants set fire to the wooden doors of the Bank of France. In Paris this weekend, they drove a forklift through the gates of the state ministry, forcing the evacuation of Macron’s spokesperson. I saw my first bog person on the windswept, rocky West Coast of Sweden. Inside the white walls of a candleabra-filled, Valhalla-like bastion where Swedish kings had duked it out with the Danes for hundreds of years, I stumbled on Bocksten man. He died sometime in the Middle Ages. The first thing you notice is his hair—lush, curly red locks on a skull, preserved as in life. Like most bog people, he suffered a gruesome death. First, he was killed by a blow to the head. Then, a stake was driven through his heart. Then someone impaled him so he would stay at the bottom of the lake.Thats right, they had gone through the effort of impaling him with spikes so his body would stay at the bottom. The reconstructed wax model of him was the spitting image of Frodo Baggins—the hooded cloak, the sheathed dagger. His brown, hair-shirt cloak survived in perfect condition. He was about six foot one and probably thirty five years old when he met his ignominous end. The idea was clearly to double-kill him so he wouldn't come back to life and haunt or take revenge on his killers. You respect him more when you think about the lengths they went through to keep him down even after death. A massive piece of building timber juts out of his exposed ribcage. And that beautiful hair. I wanted to break through the glass case and run my fingers through it. Poor Bocksten man. What did he do? Why go through all that? Was he some kind of witch and they were worried he was going to reanimate if they didn’t fasten that body down with spikes? If you had stumbled onto this scene, you would have asked: What exactly is going on here? Bocksten man was discovered in 1936 by a Swedish scholar on his way to a midsummer party in the seaside village of Varberg. According to the Danish scholar P.V. Glob—whose name is so perfectly suited for his authorship of the seminal monograph The Bog People: Iron Age Man Preserved—he could have been a rabble-rouser killed by local peasants for trying to agitate against the Danish king. “The bog is the meeting point of four parishes and according to old beliefs he would not be able to escape from such a spot to revenge himself on his murderers,” Glob wrote. Bog people have been found across a broad swath of Northern Europe from 1450 to present. Many were discovered during the years of World War II, when the war-exhausted populations in Northern Europe were forced out into the bogs to cut peat for home fuel, like their ancestors from the Middle Ages. Bog peoples hands and feet are delicate and smooth—they were unaccustomed to labor. The last meal found in their stomachs is often a specific combination of spring grains and seeds, lending support to the hypothesis that they’re sacrifices to spring. Many also have a special twisted noose tied around their necks, which serves no clear function. The ancient historian Tacitus, in his writings on the Germanic tribes, suggested that bog people were human sacrifices. The victims were possibly chosen by drawing straws. 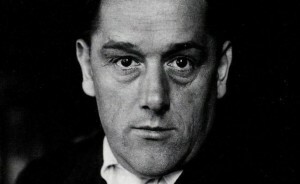 He added that, according to Germanic law, “traitors and deserters are hung from trees; cowards, poor fighters, and notorious evil livers are plunged in the mud of marshes with a hurdle on their heads.” This theory was taken up and utilized for other purposes by nazi antiquarians. 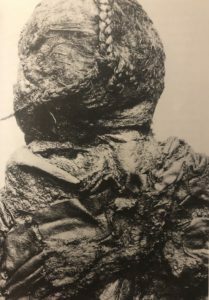 The most stunning of all bog persons is Denmark’s Tollund Man—his perfectly marbleized form, his serenely sleeping face, his well-kempt fingers and toenails, the delicate bit of stubble on his chin, the perfectly preserved noose around his neck that was used to strangle him. Nothing compares to him in terms of sheer preservation of an ancient person—not Pompeii, not the Egyptian mummies. At 2,300 years old, the bog acids have made his head the best preserved in the world. I wasn’t necessarily seeking them out, but the bog people found me again in a dimly lit corner of Dublin’s National Museum.The Irish bog people were a different breed altogether. They were also around two thousand years old. But many had suffered unfortunate encounters with peat-cutting machinery or been otherwise decapitated or rearranged before their discovery. This has left them undefined and protoplasmic, chunks and sections of person, like grindhouse horror, or the thing coming out of the TV in that David Cronenberg movie. Still, what is human is still discernible—Clonyclaven man’s flattened face is as immediately shocking and horrifying as coming upon a person who has just been hit by a car. You are hit with an immediate wave of empathy and worry for a fellow human. And that striking pile of beautiful red hair on his head, undying and ageless, not so different from our president’s. Researchers have found that he was wearing imported hair gel at the time of his death. Old Croghan man too, reduced to just torso and arms. And yet, the arms are held out and flexing in a power pose of defiance—the skin is deflated and leathery, but you can make out all the strength that was there in life. There is even a lovely woven band wrapped around his left bicep. In the car in a downpour with my mother, driving me to the airport. The rain comes down in sheets—the other cars on the highway swerve in and out of the mist, like gorillas. “You know, it’s amazing—once you get above those nasty dark low-lying clouds and storms, its all clear blue skies up there. Emotions can ferment and rot in your insides. They can spoil at the bottom of your stomach, unvoicable. They can block your bowel movements or give you diarrhea; they can sit at rest somewhere in your intestines and keep you from getting effectively drunk. They can keep the coffee from working, or force you asleep before you’re tired like a narcoleptic. They can make the food taste like metal and make your stomach rumble and make you wish you could breathe fire. You can let them sit there inside you OR you can vomit them out. You can scream in punk bands, or along to Black Flag records. You can ease them out with osmosis, or by hanging upside down in your closet. You can coax them out with paragraphs written on a park bench, like this one, and afterwards notice how you feel better than any running, excercising, or yoga could ever make you feel. You can forget about them and hope reading the news, or having a boyfriend or girlfriend, or staying very busy with mildly repetitive tasks can help. Or you can sit down and try to untangle them—choking and pulling them out from your throat like entrails, and laying the yards on the table, smelling like a dead animal; a jumbled, nonsensical mass of life lived, gradients of positive and negative experience—unanalyzed and hopeless. These are things we have to sort out for ourselves.